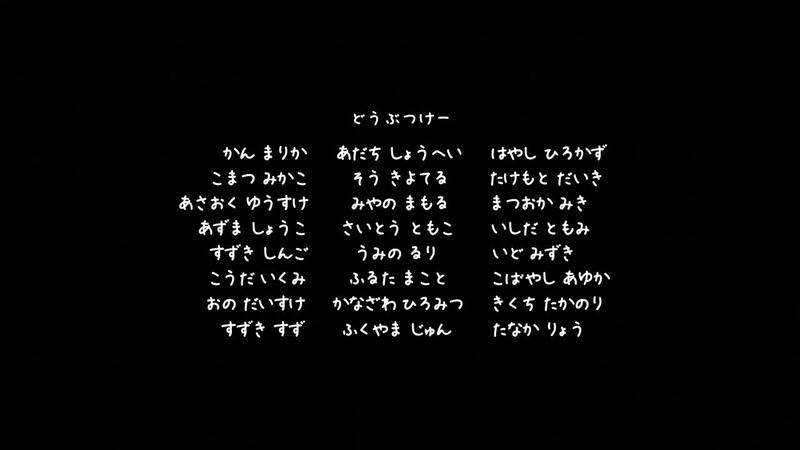 Unlike the rest of the credits, which are in a standard serif'd font (Mincho-like), these credits are in a rounded, handwriting-esque font. The header for the section reads どうぶつけー doubutsukee, which I imagine has something to do with 動物 doubutsu "animals". Then, it lists the names of 24 people, all of which are written in pure kana, which looks kind of "childish". What are these credits for? I suspect this is really more a question about K than it is about the Japanese language, since when I DuckDuckGo for どうぶつけー, all of the results are related to K in someway. I did a bit of clicking around, but I wasn't able to figure out what's going on here. This is unrelated to the film in any way, its referring to the people that designed the animal characters that are based on the characters. They are referring to the goods designers for the goods depicted here. By the way, just to add in, the products are called Dōbutsu K, literally Animal K.